Moldova Kiōng-hô-kok (Moldova-gí: Republica Moldova) sī Tang-au chi̍t-ê lāi-lio̍k kok-ka. ↑ Roudik, Peter (23 December 2013). 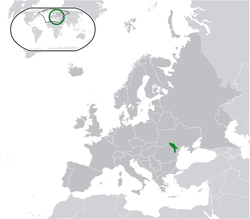 "Moldova: Romanian Recognized as the Official Language". Law Library of Congress. 13 June 2014 khòaⁿ--ê. ↑ "The text of the Declaration of Independence prevails over the text of the Constitution". Constitutional Court of Moldova. 5 December 2013. 13 June 2014 khòaⁿ--ê. ↑ "Preliminary results of the 2014 census" (PDF) (Press release). National Bureau of Statistics of Moldova. 2 January 2015. ↑ 7.0 7.1 7.2 7.3 "World Economic Outlook Database, April 2016". International Monetary Fund. April 2016. 14 April 2016 khòaⁿ--ê.